The Upper East Side has several ice cream spots to cool you off this summer. UPPER EAST SIDE — It's not officially summer yet but the weather says otherwise — and so do the lines at ice cream shops in the neighborhood. If you're looking for a fun sweet treat, look no further than Emack and Bolio's. which is known for its wild concoctions like its salted caramel with chocolate covered pretzels, and its "Heaven" flavor with vanilla bean speck ice cream and marshmallow swirl and white chocolate chips. The shop has 34 ice cream options and a mix of sorbets and frozen yogurts. Husband and wife team Jaime and Glyn sell tons of candy but they also specialize in artisanal ice cream and gelato. Flavors range from "Chocolate Chunk" to "Coffee Crunch," "PB&J" and "Thai Tea." 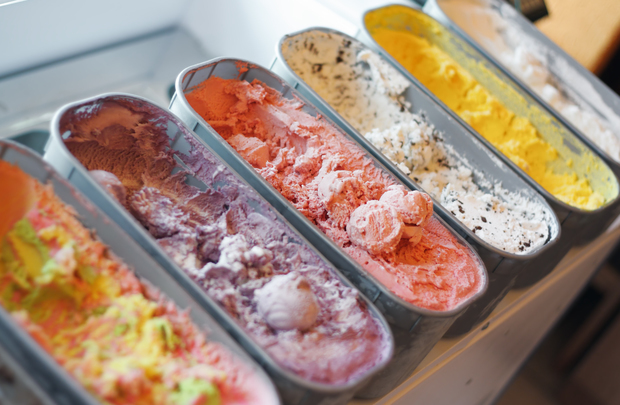 Its gelato and sorbet are made with local and natural ingredients and for those who need gluten-free or dairy-free options, the shop offers a few selections. To keep things fresh, new flavors are posted every day. If you're feeling adventurous or innovative, head to Cool Mess, where you can make your own ice cream. Choose a base flavor and follow the shop's recipes, or create your own flavor. Once you put in all the ingredients, the machines will make your ice cream. The Loucas family, also behind Burger Heaven, launched the ice cream shop in January. The number of flavors at Sedutto is impressive with at least 40 to choose from, like coffee mud pie, rum raisin, red velvet, double chocolate chip and several flavors of sorbet and soft and "hard serve" yogurt. Sedutto also sells wine ice cream and sorbets for those who want a little spike in their treat. Pick from Riesling, chocolate cabernet, champagne, ruby port and sangria, among others. If that's not enough for you, the shop has shakes, malts, floats, egg creams, smoothies, ice crease soda and "espresso shot shakes." Top your treats with the candy, fruit or syrup of your choice. Sprinkles Cupcakes has an ice cream shop next door that offers a long menu of traditional flavors, including some exciting ones like red velvet, coffee fudge almond, coconut fudge almond and even "Cap'n Crunch." Feeling adventurous? Try the shop's ice cream sandwich, its triple scoop sundae or its frozen hot chocolate. Make sure to check the schedule, however, some days certain flavors aren't available. While people debate over whether gelato is ice cream, you can enjoy it at the newest addition to the neighborhood — M'o Il Gelato, which is a company out of Bologna, Italy. Using fresh and organic ingredients, M’o Il Gelato serves more than 20 flavors, including specialties like “Delirium,” made with chocolate chip cookies and chocolate fondue, and “Monella,” made with Amarena cherry, toasted almonds, hazelnuts and dark chocolate. The shop also serves sorbet for those who like a fruitier treat.